The mild steel terminal box range, STB, with a IP 66 protection degree, is available off the shelf in many different sizes. The STB range is well suited for demanding indoor environments. Water and dust are prevented from entering the terminal box, thus eliminating the risk for component failure, and with that, unnecessary downtime. Folded and seam welded. Four 8.5 mm diameter holes for wall fixing. Four M6 × 13 studs for bottom profiles / mounting plate fixation. Sealing is ensured by an injected one piece polyurethane gasket. M8x18 mm earthing studs in body and cover, M8 nuts, earthing washers and earthing labels. IP 66 | TYPE 4, 12, 13 | IK 08. RAL 7035, structured powder coating. Body, cover, cover screws, fixing screws, cover plugs, and earthing facilities. 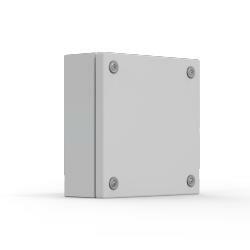 Mild steel terminal box, available in a wide range of sizes, with a high IP 66 protection degree. The mounting plate, BMP, and DIN profiles, BDR, mounted on profiles, BPP, have to be ordered separately, in order to complete the installation of the terminal box.